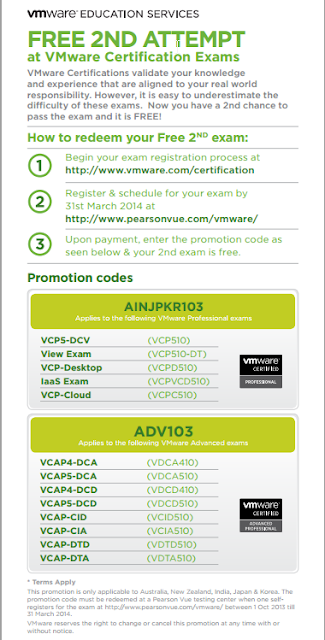 Virtualization & Cloud Technology: FREE 2ND Attempt at VMware Certification Exams ! Dear All, Good time to go, those who are preparing the certification and have some doubt in mind you can get benefit of this promotion, at the time of booking exam at 1st time you need to apply the below mentioned promotion code, so in case you are not able to manage at first time. You can take the exam 2nd time free........ So hurry up offer valid till 31 March 2014. Thanks sadly they are for Australia, New Zealand, India, Japan & Korea only. Any codes for UK?